Avignon is a city in the Vaucluse department, located in the region Provence-Alpes-Côte d'Azur in southeastern France. The city itself has around 90,000 inhabitants, though the total metropolitan area is more than three times as big regarding the number of inhabitants. For more information, also see the official Tourist website of Avignon. Notre Dame des Doms, the cathedral. Palais des Papes (Papal Palace). 4.3 kilometres of ramparts, remains of medieval fortification. Several old (ruined) bridges over the river. Festival d'Avignon - mainly about art. Avignon has a typical Mediterranean climate though with slightly bigger temperature differences between summer and winter and rain is possible during all months. Summers last from June to September when average daytime temperatures are between 28 and 31 degrees Celsius and nights are around 14-16 degrees. Winters are from December to February when it's between 9 and 12 degrees during the day, with chilly nights of just 1-3 degrees Celsius on average. Occasional frost and even snow are not unheard of, but usually won't last long. Precipitation is highest during autumn (October-November) and also in May. Summers, but also winters are relatively dry. Avignon-Caumont Airport (8 km from the city) has a few services. Flybe flies to Southampton and seasonal to Exeter. Jet2.com flies to Edinburgh and Leeds. For a much wider choice, the airport near Marseille is a good alternative. The French Railways provides TGV (highspeed) trains to and from a number of places including Paris (just over 2,5 hours!). They all arrive/leave at the Gare Avignon TGV 4 kilometres southwest of Avignon in the suburb of Courtine. From Gare Avignon Centre the TGV to Paris arrives/leaves as well. Also from here, Transports Express Régionaux provides regional services. These include trains to Arles (20 minutes) and Nimes (30 minutes). During July and August, there are direct services from London (6 hours) and Ashford (5 hours) by the Eurostar train. Avignon is just east of the A9 (towards Montpellier and west of the A7 (towards Marseille highways. There are bus connections with Aix-en-Provence (1 hour), Arles (1,5 hours), Marseille (35 minutes) and Nimes (40 minutes), among other regional services. Long distance services are with Linebus and Eurolines. Restaurant Christian Etienne - Michelin starred restaurant with specialised tomato and truffle menus. Auberge de Cassagne - Classic Provencal restaurant in a hotel with full spa facilities. 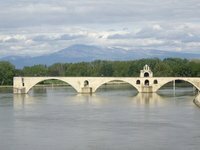 We have a comprehensive list of accommodation in Avignon searchable right here on Travellerspoint. You can use our map to quickly compare budget, mid-range or top of the range accommodation in Avignon and areas nearby. This is version 11. Last edited at 3:32 on Aug 2, 17 by sleepBot. 14 articles link to this page.